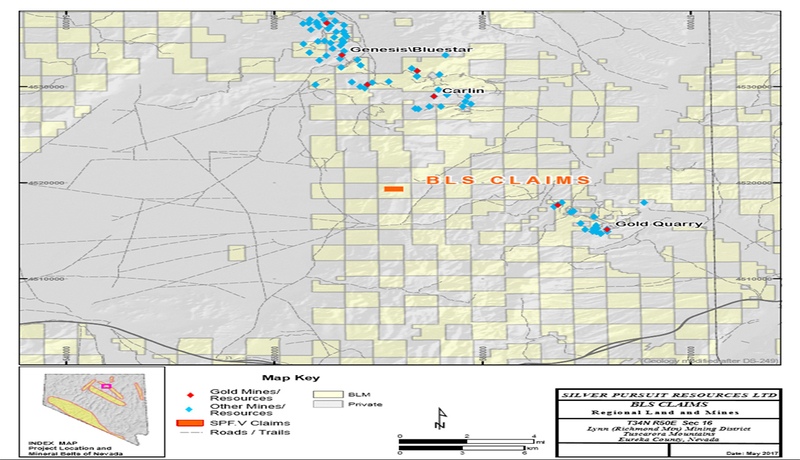 The BLS Claims are located on the Carlin Trend, near the Eureka- Elko County boundary in the Tuscarora Mountains. The original Carlin Mine is approximately 6 miles north. The Gold Quarry complex is some 6 miles southeast of the claims. 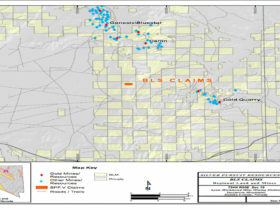 Six lode claims make up the current holdings and are situated 2 miles southwest of Richmond Summit. Elevations range from 5300 to 6690 feet (1615-2040 m) in the project area. Gold mineralization hosted in the near surface by dikes cutting Ordovician sedimentary rocks and deep gold mineralization hosted by lower-plate, carbonate rocks were intersected by mineralized dikes. A second potentially important target is where mineralized intrusive bodies are emplaced along favorable low-angle horizons. The Carlin trend is known to have low-angle faults that are important ore controls. 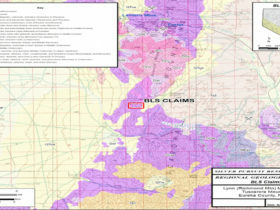 The “West Lynn thrust” is mapped at the surface less than two miles from the BLS Claims and lower-plate rocks have been intersected by the previous drilling at the BLS claims. Exploration drilling would test the intersection of intrusive bodies with the thrust. 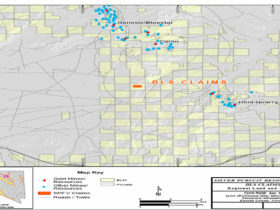 Silver Pursuit Resources holdings are located in Section 16, a BLM- administered section within a “checkerboard” of private holdings. 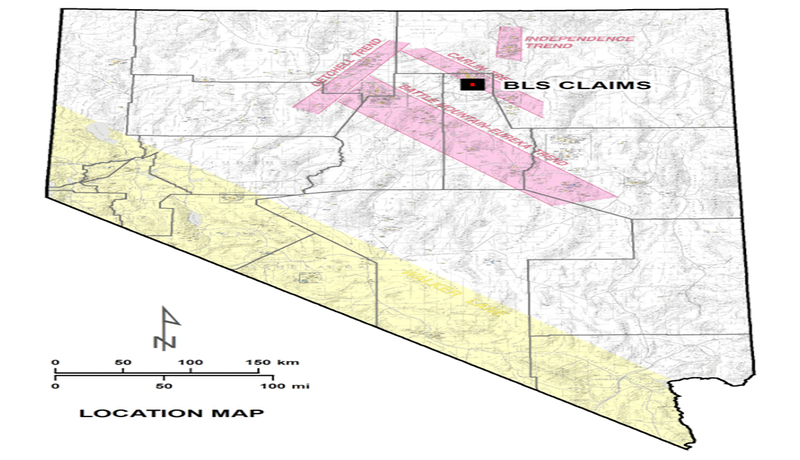 The current Silver Pursuit holdings are surrounded by claims held by Nevada Gold Corporation. The nearby private lands of the checkerboard are controlled by Elko Land and Livestock (a Newmont company). 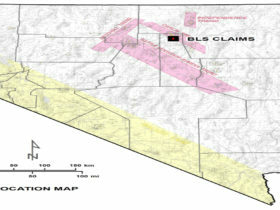 Newmont holds other BLM sections adjacent to Section 16 as well. 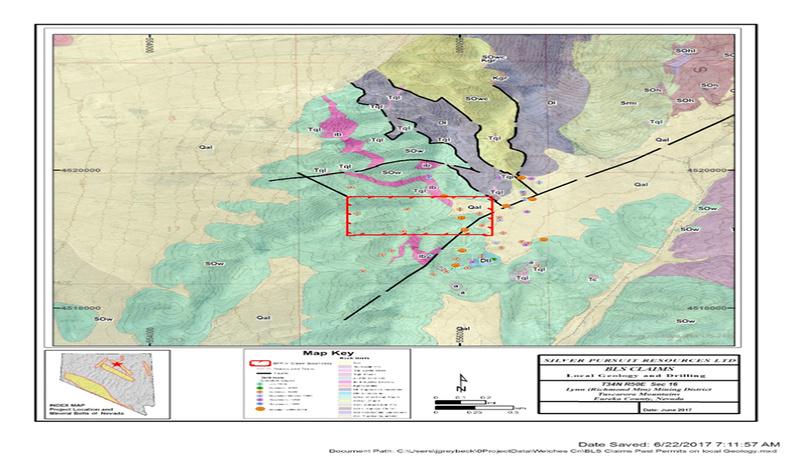 Results of the Redstar exploration, in Section 16, have been reported in a series of press releases from January 2008 to February 2010. These are summarized here. In January 2008, Redstar reported gold from surface samples carried up to 7.75 g/t Au and that drilling had returned assays with up to 2.5 g/t gold over 3.28 meters. Goldfields entered as a joint venture partner and drilling and trenching were permitted to further test gold mineralization in Section 16. 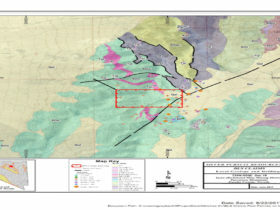 A press release from December 18, 2008 provided a summary as follows: “The 2008 exploration program included trenching, a gravity survey, a ground magnetic survey and eight widely-spaced drill holes consisting of five reverse-circulation drill holes for 4,680 feet and 3 core holes for 3,868 feet. 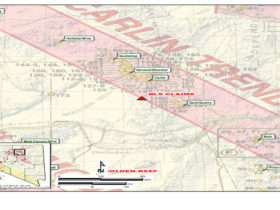 Geophysical surveys and drilling defined a dyke-filled, north-trending structural corridor extending the full length of the property (one mile); the structural zone is the southern extension of the Post fault system, which localizes world-class gold deposits of the northern Carlin trend about 7 miles to the north.” Dikes with strong argillic alteration carry up to 0.70 g/t gold and have anomalous arsenic concentrations. Carbonate rocks at depth are thought to be lower plate rocks which are important host rocks in the Carlin trend. Follow-up work, by Fronteer Development, included additional mapping, sampling, trenching and drilling. (February 23, 2010-press release). 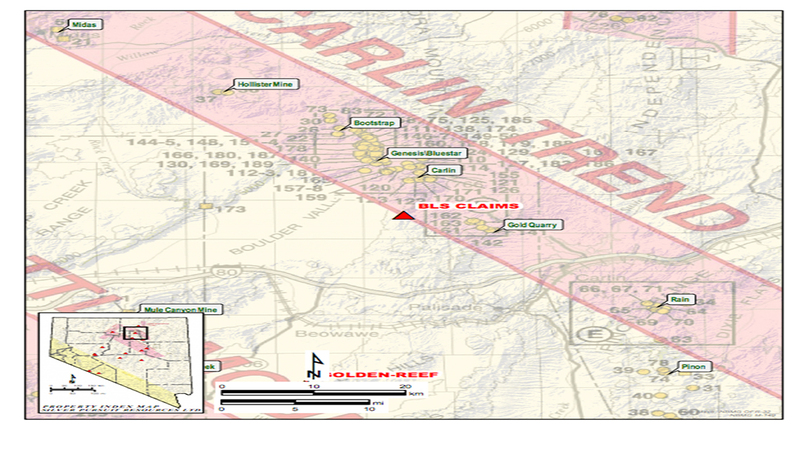 Trenching, north of the currently held claims, identified an anomalous gold zone over 72 meters in sample width. The highest individual sample value was 2.0 g/t gold. Four holes were completed and successfully intersected the lower-plate, carbonate rocks. The drilling assay results included “anomalous gold and elevated trace elements, particularly arsenic”. The values are present at the margins of the dikes. The geology at the BLS claims is made up of upper plate, siliceous, rocks included in the Vinini Formation which is intruded by multiple episodes of younger dikes. The Vinini Formation, south of Richmond Mountain, is mostly of fine-grained sediments with ledges of chert that are from a few feet thick to 50 feet thick and exposed over a few hundred feet of strike length. Just south of the BLS claims, an exposure of limestone is present. These rocks may be part of the lower plate sequence and those encountered in the previous drilling in Section 16. All Paleozoic rocks are cut by Tertiary dikes and small plutons of intermediate composition. The work by Redstar confirms that anomalous gold mineralization is locally present on the margins of the intrusive rocks. Studies of Tertiary intrusives in the Carlin trend show a likely genetic relation to gold mineralization and in several mines are important ore hosts. Reports by Redstar of geophysical indicators of a series of north-south structures is thought to be important to the emplacement of the intrusive bodies. The southeast corner of the BLS claims is situated on the “Richmond Summit Fault” which is a major NE-trending structure that bounds the Paleozoic rocks on the west from younger basin-fill on the east. 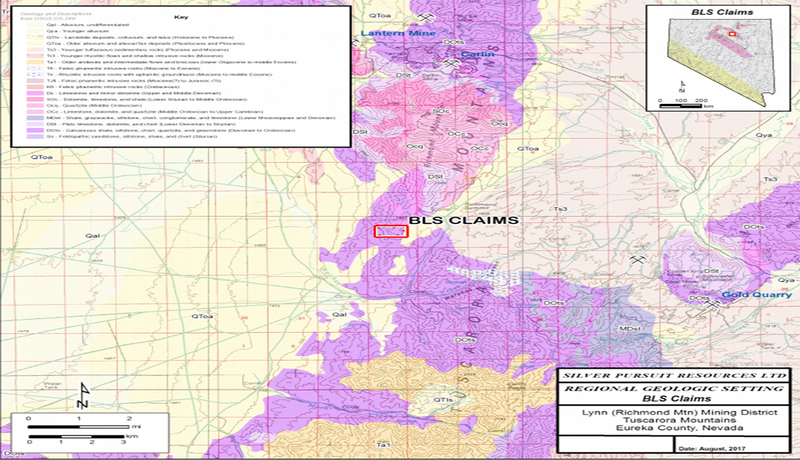 Gold mineralization at the BLS claims that has been discovered to date is largely related to structural controls and the presence of igneous bodies along structures that are thought to be deep-seated and cut the lower and upper plate rocks of the Roberts Mountains thrust. Some intrusives may be sill-like and emplaced along low-angle faults or favorable bedding horizons. Redstar press releases discuss the presence of high arsenic anomalies in proximity to the gold mineralization. Geochemical anomalies of arsenic are common in association with Carlin trend mineralization. The presence of gold and arsenic marginal to intrusive bodies and in fracture zones of the upper plate rocks suggest that targets at depth are present where the structures cut the more favorable lithologies of the lower plate rocks. In particular, the laminated carbonate rocks above and below the Devonian “Popovich” Limestone represent targets for future deep drilling at the BLS claims. 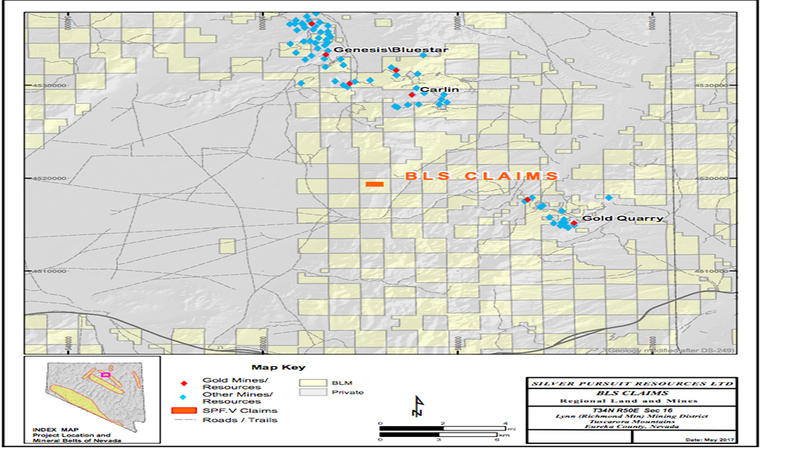 Geologic mapping and sampling are planned to determine the extent of altered intrusive rocks on the claims. Systematic float chip sampling is to be carried out to establish the distribution of trace and precious metals at the project. Geophysical surveys may be conducted to gain an understanding of the subsurface geology and develop favorable target zones to be drill-tested in the future.